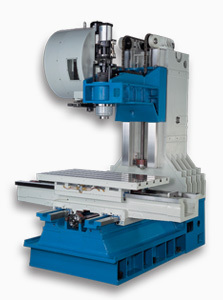 The V series vertical machining center from ES Corporation offers extraordinary stability and heavy-duty cutting capabilities. ESPEED VMC's have won a high reputation from domestic and international customers. Box ways on three axes. The major structural parts, such as the spindle stock, saddle, base, table and column are manufactured from Meehanite (FC30) cast iron and stress relieved to ensure consistent machine accuracy and rigidity. The table is fully supported on the entire stroke, assuring superior stability for heavy loads. The counter-balancing system on axes is equipped with two guide ways to avoid vibration during rapid traverse while providing and extremely fine machining surface effect. The spindle features a floating tool release design to prevent the spindle bearings from bumping during tool changing. This also extends the spindle service life and durability. The lubrication system for three axes employs a volumetric oil distributor, combined with well-arranged brass oil tubes uniform lubrication points and oil amount on the far and near ends. It fully eliminates the problems of uneven lubrication on all slideways . Class C3, pre-tensioned ballscrews on the three axes and double nuts, combined with pre-tensioned ballscrew supports at both ends, fully eliminate transmission backlash. Ballscrews have been subject to compensation for thermal growth errors to assure high positioning accuracy and repeatability. The bearing arrangements on the X and Y axes are three each at the front and the rear. On the Z-axis there are three bearings at the upper end and two at the lower. The pneumatic system parts, F.R.L. combination unit and solenoid valves employ American Parker brand and French Legris air hoses featuring minimum trouble and long service life. The counter-balancing system is equipped with Japanese-made TYC BL634 silent chains which greatly extend service life. The spindle is mounted in P4 combination-type angular contact ball bearings for superior axial and radial thrust capabilities. Machines are 100% HP laser inspected and ball bar tested before positioning accuracy and fine servo-tuning. Armless type ATC system is driven by pneumatic system. Tool magazine has a capacity of 24 tools to meet various machining requirements; tools can be loaded and unloaded easily. Random tool access editing simplifies the registration and control of tools. 3-axis servo motors are directly coupled to the ballscrews. It ensures the least backlash and long-lasting accuracy. Floating drawbar design is to avoid damaging spindle bearing during changing tools. Adopts the equal arrangement of the oil points for the volume-type distributors. It results in oil spreading evenly on all sliding surfaces. Powerful auger type swarf removes swarf quickly and easily. * We reserve the right to change design, color or specification without notice. No.1-6, Jhongjheng Rd., Dyay Township, Taichung County 428, Taiwan.